I don't have anything new to report or anything exciting happening so I'm just gonna post pictures. 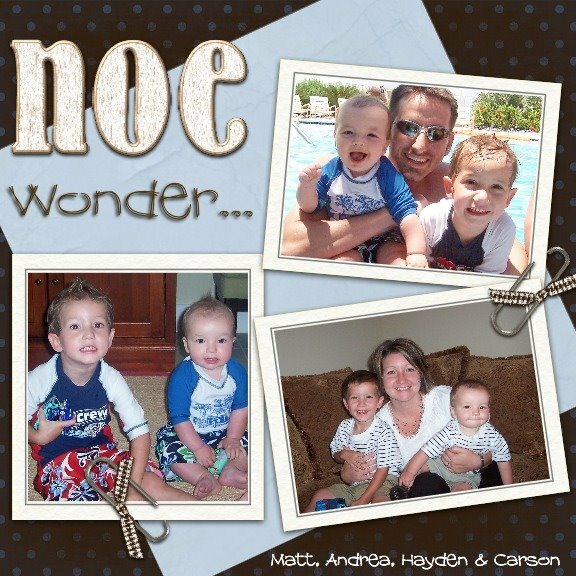 The first three pics are of Hayden and his cousin Chance. Hayden just usually plays beside other kids and doesn't even really know they're in the room with him. When he's with Chance, he actually plays with him. Chance is three and Hayden does everything Chance does. It's so cute! The next picture is of Hayden asleep on our couch....at 9:30 in the morning!! He fell asleep that early because since Hayden has been sleeping in a twin bed, he gets up between 6:00 and 6:30 every morning!!!! This hasn't set well with me since I'm pregnant and really need my sleep! The next three pictures are of some of our church friends. The men had a retreat this past weekend, so Friday night us girls got together to let the kids play and we ate pizza and cookies. I love this next picture. This is of Hayden at the mall play area, that I think he'd go to everyday and never get sick of it! I just think he looks just like Matt in it. The last picture shows Hayden's personality...at home. We bought him a dog "pack pack" that's actually a leash. He's not a fan of using it for that, but he loves to wear it at home. He calls the leash part his tail! The funny part to me is that if you click on the picture to make it larger, you can see what this child has on...by choice. A white under shirt, sweat pants, flip flops, and a waffle in his hand! He likes to walk around in different shoes in the house. Too cute. Well, sorry I just had to brag about my cute kid here. Nothing new to report. I'll report some baby news after my next doctors appointment in a little over a week and I'll post pictures of the house once there's something to post other than dirt! For those of you who don't know, Matt's mom Valorie has Multiple Sclerosis (MS). She's had it for about 20 years and as long as I've known her, she's been sick with severe symptoms of this devastating disease. It's a very helpless feeling to be around her. It almost seems like every time we see her, she has a new symptom and her health has declined in some way. 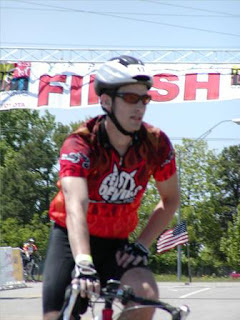 Matt wants to do something to help so he does the MS150, a 2-day, 150 mile bike ride sponsored by the MS Society. It's the coolest event I've ever been a part of. There are easily over 3,000 riders and they are all there for the same reason. Some people ride by themselves, while others form teams with people they know and/or work with. Matt rides with one of the largest teams in the nation called the Feisty Devils and their motto is "Ride Like Hell to Fight MS."
In the 2 years he's ridden, he's raised over $5700 that has been put toward finding a cure for MS. Matt rides for his mom every year and the support he receives from friends and family is amazing. The first year (2003) he participated, we were just hoping to raise the minimum $300 donation. He ended up raising over $2500 and was the 17th best fundraiser (out of 2500 riders) in the entire ride! The following year he was asked to make a speech about his mom at the pre-ride pasta dinner and it touched people we didn't even know! Once again he raised almost $3000 and rode in 40 degree weather with rain coming down sideways!! This year we're hoping to raise even more money (and hoping for sunny weather too!!) If you'd like to donate to the MS Society, there's a link on Matt's blog and you can donate specifically to his fundraising efforts. We've said this to a lot of people and I'll say it again. I know many of you have something you already donate to and we respect that. I just wanted to share with you all what my fabulous husband is doing for his mom and others with MS. If nothing else, just check out his blog...just because!! Go Feisty Devils! I guess I've had excitement in my life this past week. Enough to write two new posts in one day!! I'm sure I'll have more Easter pictures to post after this coming weekend, but these are some pictures from our church picnic and Easter egg hunt yesterday. I guess we did it a week early b/c so many people leave town on Easter weekend. We had the festivities at Grapevine Lake with Spring Creek BBQ, homemade side dishes and desserts, bounce houses, the Easter bunny came, and egg hunts for all ages. The adults even had an egg hunt with great prizes in the eggs...Mavs tickets, money, gift cards etc. Hayden needed a lot of help from Matt since he's one handed for the time being, but he got some yummy candy! I just love our church and all the young families. You can get a small glimpse of all the kids we have in the pictures. This wasn't even everyone with kids and we have so many newborns and babies on the way it's insane!! It's a great place to raise a family! We had our first big accident last Tuesday. Hayden went crib diving and broke his arm! Of course I was the one putting him back in it over and over telling him "that's a No-No...we don't jump out of our crib...you get back in there and take your nap! etc. etc" Well, about the 4th time I put him back in, he jumped and screamed. I'm pretty sure that was the moment it happened. We spent about 4 hours in the ER that night and then met with a pediatric orthopedic surgeon Wednesday, who then scheduled it to be "fixed" on Thursday. They put Hayden under, put his bones back into place, then put a cast on it that he'll wear for about 4 weeks. It hasn't phased him one bit. He figures out how to pick everything up one handed, he goes 90 miles an hour still and if he needs some help doing something, he just lets us know. We'll see what his attitude is like around week 3 or 4, but as of right now, he's doing great. Here are some pictures of the little guy!.....oh, and one of them is of our first "trash bag on the arm bath!!" Good times.